Neil deGrasse Tyson may be a fabulous scientist, and a consummate showman, but he’s downright terrible at accurately quoting people. Or, if you’re a “glass half full” kind of person, you might say that Neil deGrasse Tyson is pretty amazing at needlessly fabricating quotes and scenarios to showcase his own brilliance. We’ve already established that a newspaper headline touted for years by Tyson likely doesn’t exist. We’ve also established that the exact quote he uses to bash members of Congress as being stupid also doesn’t exist. And then we established that the details within one of Tyson’s favorite anecdotes — a story of how he bravely confronted a judge about his mathematical illiteracy while serving on jury duty — seem to change every time Tyson tells the story. In addition to those two highly questionable quotes and one highly questionable story, we now have another blatantly false quote peddled by Tyson. He has peddled this quote for years (including at a presentation on Sunday night at the Paramount Theatre in Seattle). TYSON: Here’s what happens. George Bush, within a week of [the 9/11 terrorist attacks] gave us a speech attempting to distinguish we from they. And who are they? These were sort of the Muslim fundamentalists. And he wants to distinguish we from they. And how does he do it? Neil deGrasse Tyson’s story has three central claims: 1) Bush uttered that precise phrase, 2) in the days immediately after 9/11, 3) in order to distance American religion from that practiced by radical Muslims. As you have probably already guessed, every single claim is false. Every one! Then there’s Tyson’s aside that Bush’s quote was a “loose quote” of the book of Genesis. Yep, that’s false, too. Add embarrassing biblical illiteracy to Tyson’s list of accomplishments on his CV. I don’t have a Ph.D. in physics, but I’m pretty sure February 2003 did not happen in the week after 9/11. Tyson butchered the quote. He butchered the date. He butchered the context. He butchered the implication. And he butchered the biblical allusion, which was to the prophet Isaiah, not the book of Genesis (you can tell Bush was alluding to Isaiah because he explicitly said he was referencing Isaiah). Bush’s statement about the Creator had nothing to do with making “us” look better than “them”: it was an attempt to comfort the families who lost loved ones in the crash. They weren’t nameless creatures who passed anonymously; their ultimate Creator, the one who knit them together in their mothers’ wombs, mourned them by name. Heck, that same Creator even gave up his one and only Son that those lost souls might one day be reconciled to God through Christ’s life, death, and resurrection. It was a message of hope and unity, not a message of division authored in the fog of war. According to Tyson, Bush’s unfortunate God quote came long before Tyson was in Bush’s Rolodex — long before he was selected to serve on commissions to advise the president — otherwise the all-knowing Dr. Tyson would’ve set him straight and prevented him from ever saying such a stupid thing. Seriously, Tyson claimed that. When Bush allegedly uttered Tyson’s fake quote — within a week of 9/11, according to Tyson — Tyson had already been selected by President George W. Bush to serve on a White House Commission. On August 22, 2001, the White House press office announced that the president would appoint one Neil deGrasse Tyson of New York to serve on the Commission on the Future of the United States Aerospace Industry. Again, I’m no physics Ph.D., but I am fairly certain that August 22, 2001, came weeks before September 11, 2001.
.@BrianFaughnan @seanmdav If you have to distort a quote and its context to make yourself seem smarter than GWB, you’re doing it wrong. 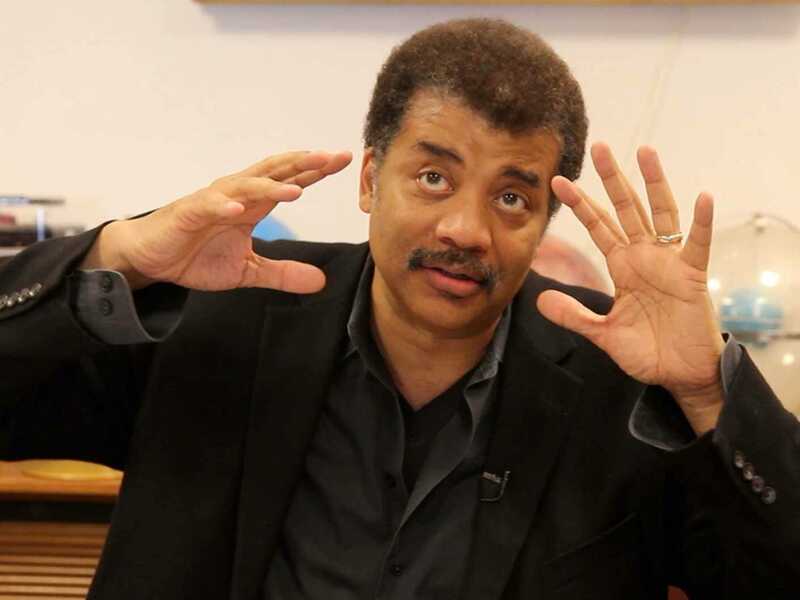 At this point, I’m legitimately curious if any quotes or anecdotes peddled by Neil deGrasse Tyson are true. Over the last week, I’ve examined only four, and every single one appears to be garbage. The “above average” headline. The “360 degrees” quote from a member of Congress. The jury duty story. And now the bogus George W. Bush quote. These are normally the types of errors that would be uncovered by peer review. Blatant data fabrication, after all, is the cardinal sin of scientific publishing. In journalism, this would get you fired. In Tyson’s world, it got him his own television show. Where are Tyson’s peers, and why is no one reviewing his assertions? Somebody seriously needs to stage an intervention for Neil deGrasse Tyson. This type of behavior is not acceptable. It is indicative of sheer laziness, born of arrogance. Please, somebody, help him before he fabricates again.